Now Android user can back up all their installed apps and system apps for free in the SD memory Card, in the Computer and also in the Cloud service like Google Drive, Drop Box and Box.net. Easy App Toolbox is an Android App that allows you to back up your Apps for Free and With out rooting your Android device. Also, this app allows you to restore it later on your device easily from Dropbox, Google Drive or from your SD memory card. 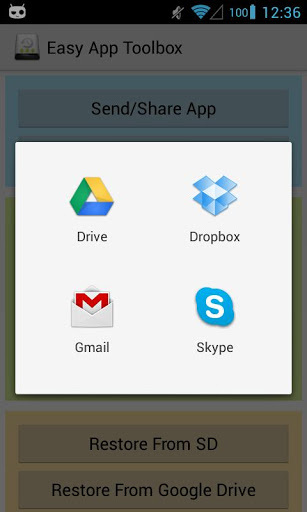 Now you can share your favorite android apps to your friends who have not Google Play store in their Android Phone. This backup will be very handy when you Reset your Android phone to Factory Default setting. Before resetting your Android Phone just use this Easy App Toolbox and take backup of your installed Apps. What you can do with this Easy App Toolbox Back up android app? Currently this Android back up released for free and Still It is in beta stage. In free version you can back up three apps at a time. You can back up unlimited apps by in-app purchase.